Harvey Scott’s Bike Club has come to an end and our graduates have earned their bikes. 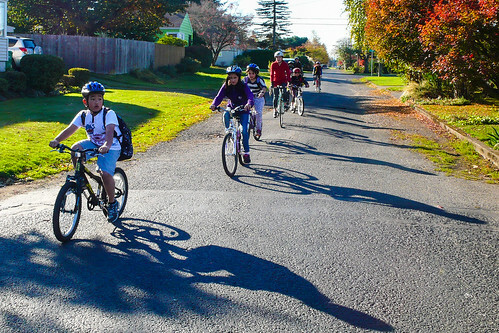 Before they went home, we asked them what they learned during their six weeks of Bike Club. 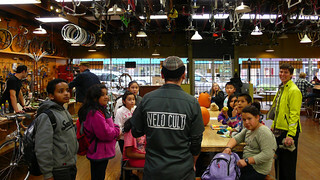 Harvey Scott Bike Club took sack lunches after school on Tuesday, November 5th, and headed out on a field trip. We rode along Skidmore parallel to the Alameda Ridge and then down into the Hollywood neighborhood, where we took over the long table (which used to be a lane at a local area bowling alley) at Velo Cult. Originally from San Diego, Velo Cult is an unusual bike shop – part full service shop, part music venue, part bike museum, and part local hangout. 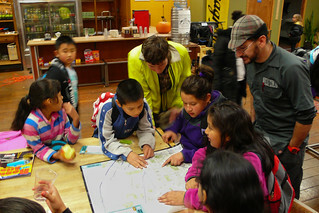 Then we took out a map and Bike Club participants showed Tomas a safe route back to the school. We rode back up the Alameda ridge, east along Skidmore, and back to school in time for Homework Club. Harvey Scott Bike Club met up with ride leader Susana of Andando en Bicicletas en Cully, also known as ABC. 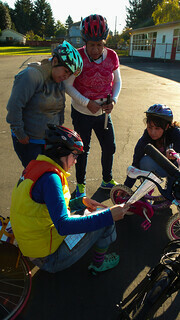 ABC is a resident-led bike committee in Hacienda, who are trained in leading rides and fixing bikes. We started off in Wellington Park, where Susana talked to the students in Spanish about ABC and how biking has impacted her life. Lale, from the Community Cycling Center’s Programs’ Team, helped translate for the few students who didn’t speak Spanish (also, the author – thanks, Lale!). Susana led us on a ride using low-traffic streets to Sacajawea park, where we had some free play and free riding (and also fixed a few mechanical issues). Bike Club rode so well and so quickly, we had enough time to extend our ride. Susana, Lale, and other ABC representatives consulted a walk and bike map and put together an extended ride back to the school featuring the separated bicycle facilities on Cully. We rode to Rigler School where our friends from ABC left us so they could pick up their own children from after school programs. After a hearty “Gracias!” and “Adios!”, Bike Club headed back to Harvey Scott. Thank you, Theo, for sharing your favorite Bike Club stories and photos! And congratulations, Harvey Scott Bike Club graduates! We look forward to seeing you ride safely on the streets of Portland.